Duodenal adenomas occur in about 0.5% of upper GI endoscopies. 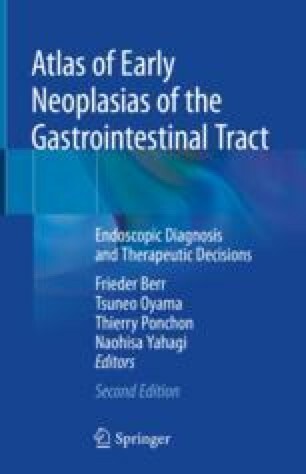 Sporadic ampullary and non-ampullary duodenal and small bowel adenomas, especially in the presence of low-grade or high-grade intraepithelial neoplasia, have malignant potential, as do neuroendocrine tumours (NET) and gastrointestinal stromal tumours (GIST). Familial adenomatous polyposis (FAP) approaches a 100% lifetime risk of duodenal adenomas and a 40% risk of advanced adenomatous polyposis at the age of 60 years. Hence, sporadic adenomas should undergo endoscopic resection, as should multiple adenomas in FAP, to downstage the Spigelman risk score and avoid resective surgery. Submucosa-invasive cancer requires major resective surgery. The variety of mucosal and submucosal lesions in the small intestine calls for diagnostic expertise to identify lesions with adverse prognosis, such as adenomas, dysplastic lesions, malignant lymphomas, NET, and GIST. Endoscopic resection of high-risk neoplasias will progress in specialized endoscopic centres.